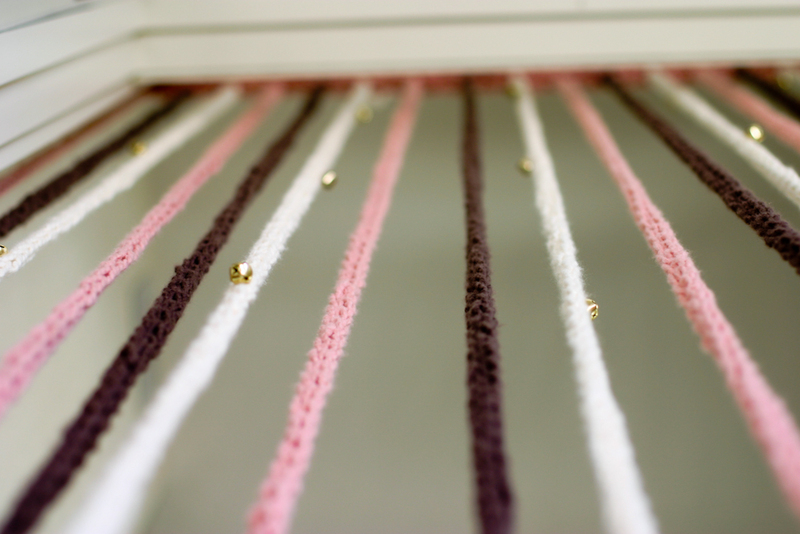 For those of you who are my age, just tell me you never wanted one of those groovy beaded door curtains from the 70s. I know I did. Something about the clickety clack of those shiny, plastic beads jangling against one another beguiled me. I never had one, of course. And, like most things like that, I outgrew the desire to have one festoon my door. But, when I think of it now, that internalized yearning for one remains. I believe that the love of things like that from when you were a girl (canopy beds, rhinestone tiaras, anything made of tulle) stay in your cells forever. 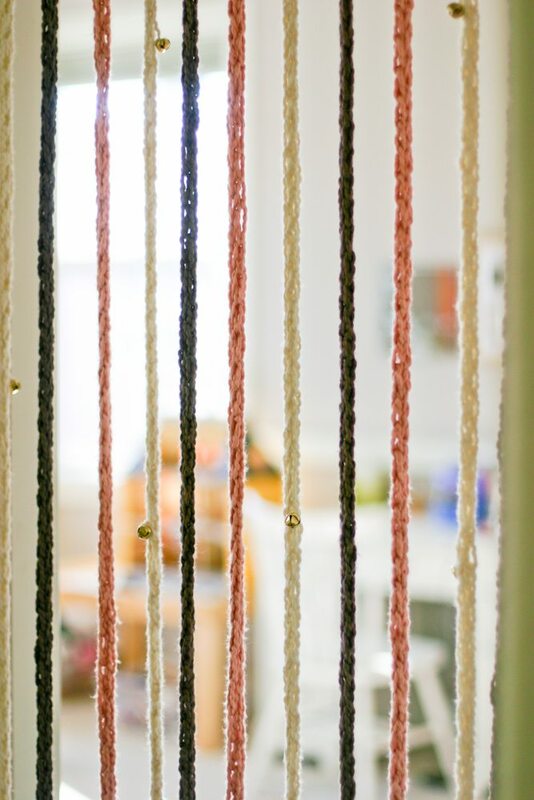 Recently, I got it in my head that it would be fun to make a door curtain made of finger-knitting, like the bead curtains of yore. But, what of the sound? 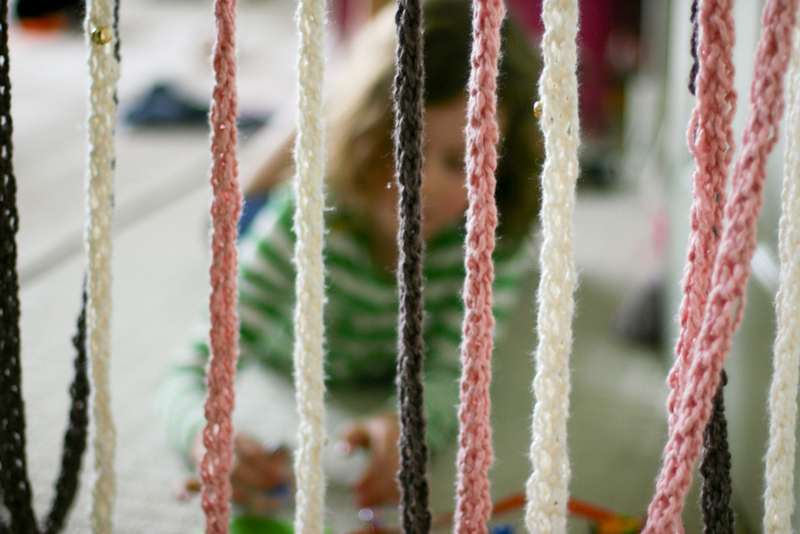 That’s when I decided to add bells to the finger-knitting for a special little tinkling upon entrance and exit. Allie and I made it together, which was a lovely experience. 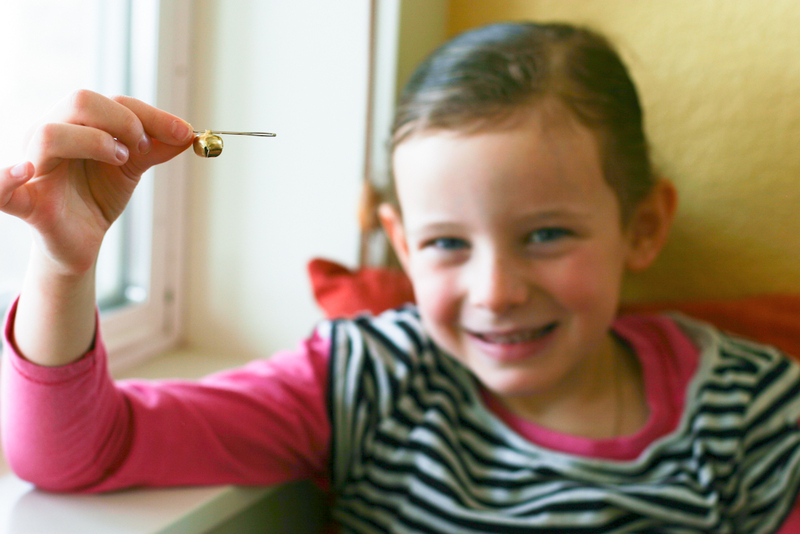 As soon as it was up, she took to it right away, running in her room and out her room just to hear the bells sound. She settled down with it after a while and played to her hearts content, feeling her room had just transformed to her own private getaway. Like most things of these sort (think said rhinestone tiaras, canopy beds, mosquito netting, etc), I anticipate the sheen of it will wear off over time, but its certainly feels glamorous in the mean time. I love the jingle jangle of the bells almost as much of the gentle clack of the beads . . . . almost. Measure the door you intend to hang the curtain on. 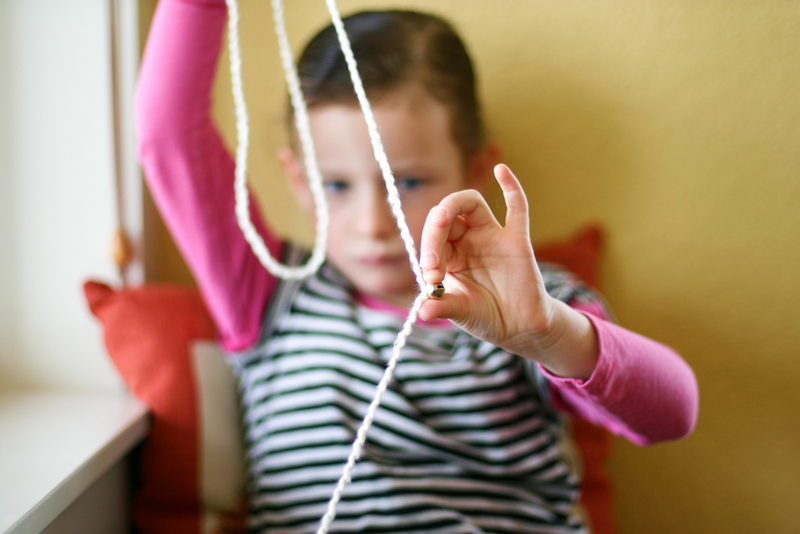 We used 15 strands of finger knitting, putting bells on five strands only, as Allie didn’t want it too jingly. Finger knit (for a how to of finger knitting go here) the intended bell-less strands to approximately 3 inches short of the distance from where you intend to hang the curtain to the floor. 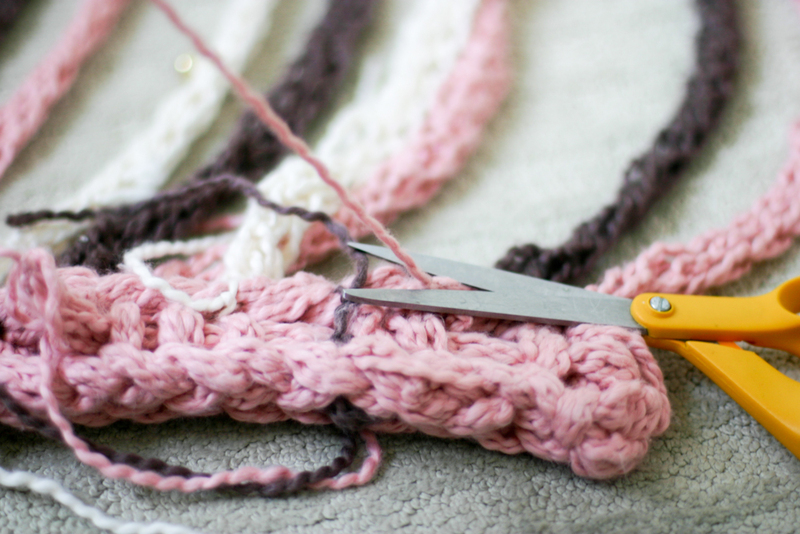 You will use approximately 4 inches to secure the strand in the top, but the strands will stretch. The bells should have a hole on top for stringing. 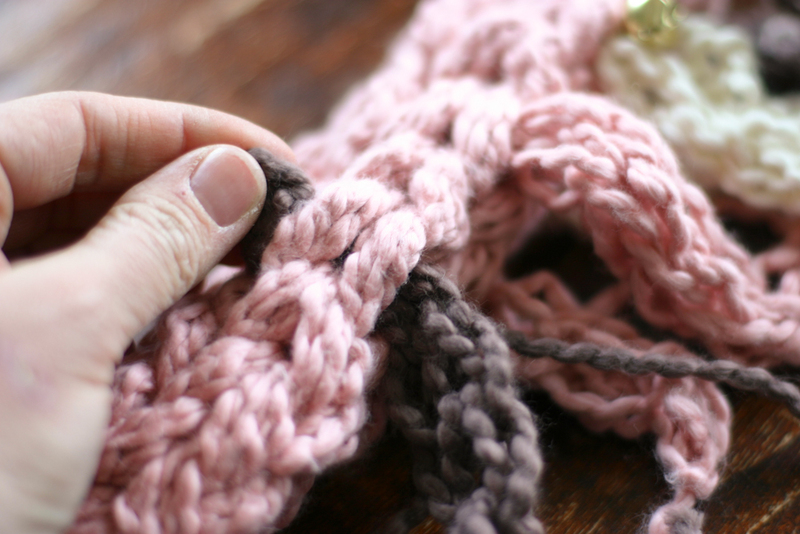 Make sure to pick a needle that fits the yarn and can still go through the hole on the bell. 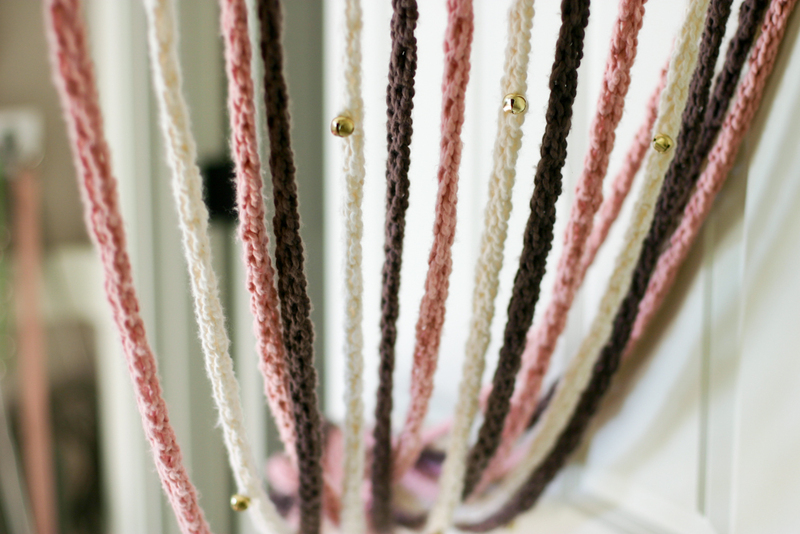 String approximately 7 to 10 of the bells onto your yarn. 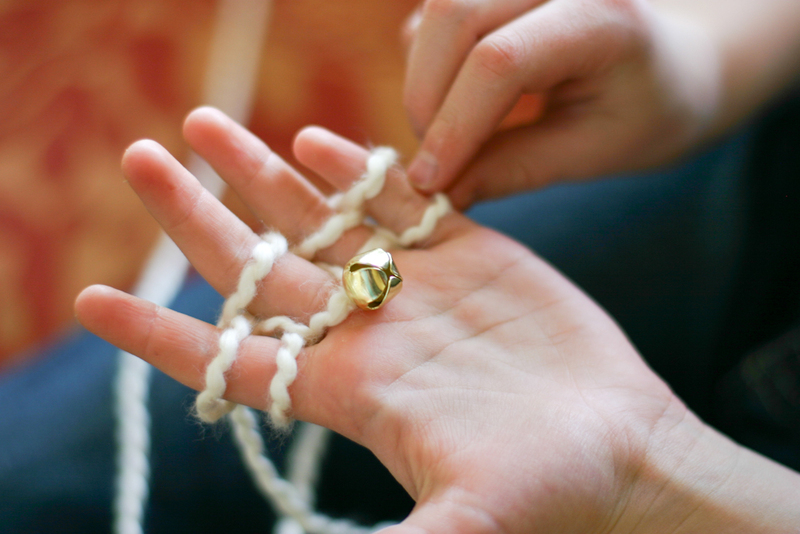 Pull the bells a good way onto the yarn, as you will use a lot of the yarn in the finger knitted strand. Finger knit approximately 8 rows (6 inches or so). If you run into the bells as you go, continue to push them down the strand of yarn towards the ball. 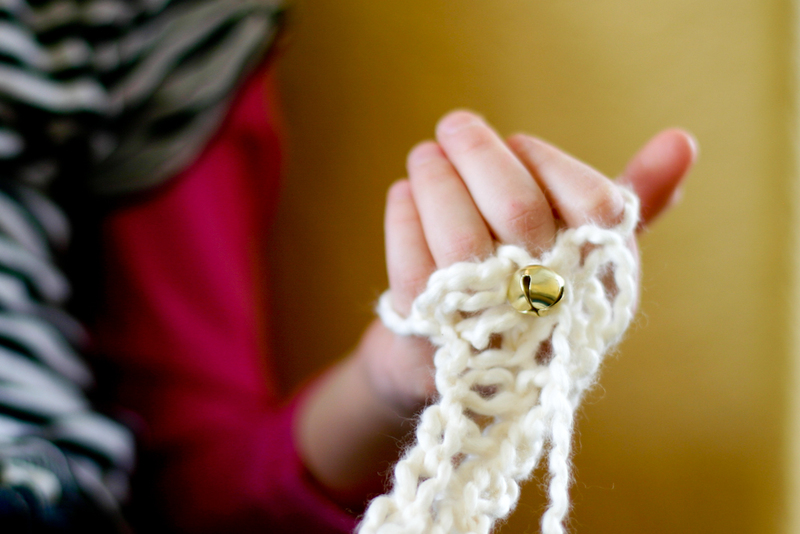 When you get to desired place for the bell, bring one bell across one of your middle fingers as part of the finger-knitting. Bring the bell and the strand over your finger, as you normally would. 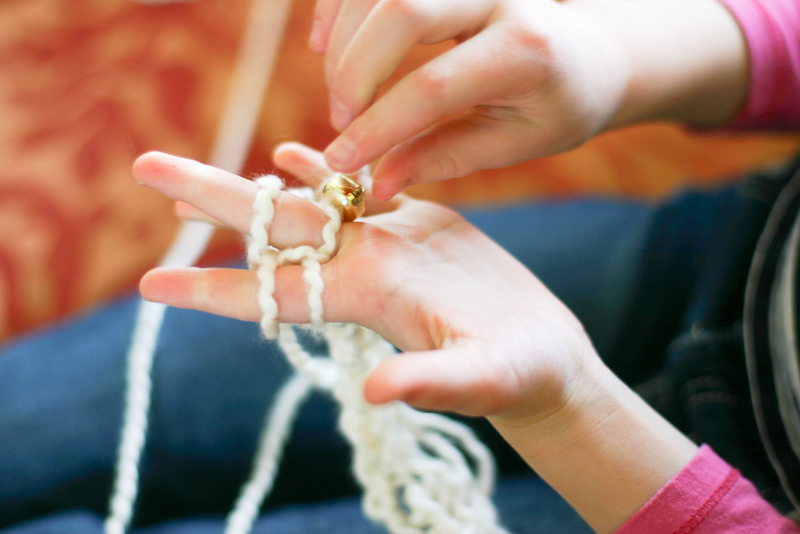 The bell should settle into the middle of your finger knitted strand. 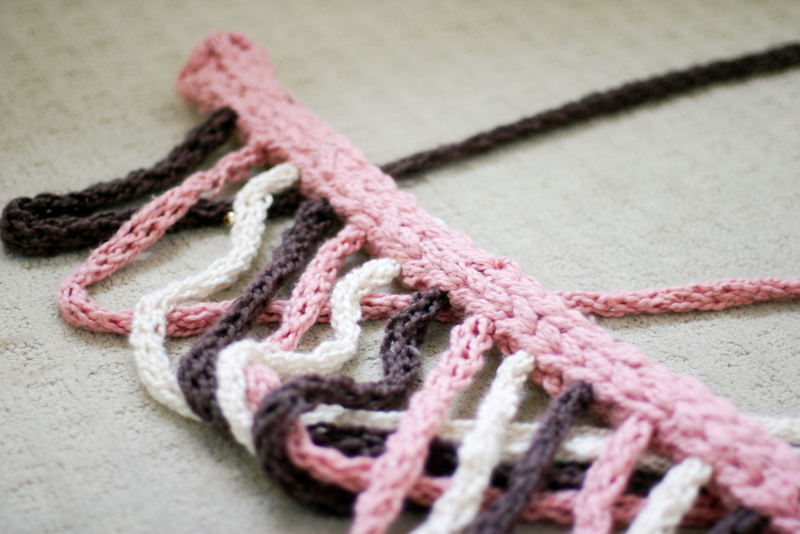 Then, continue another 16 rows or so before you place another bell. 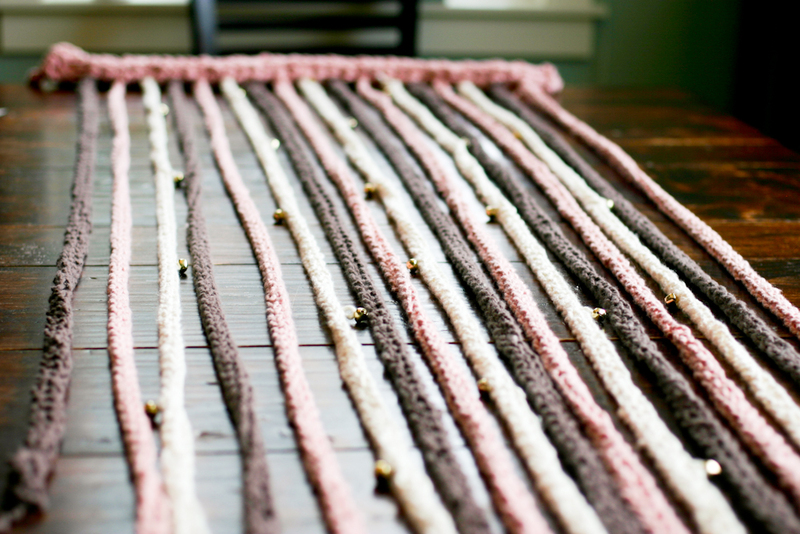 Continue to place another bell every 16 rows until the strand reaches your desired length. 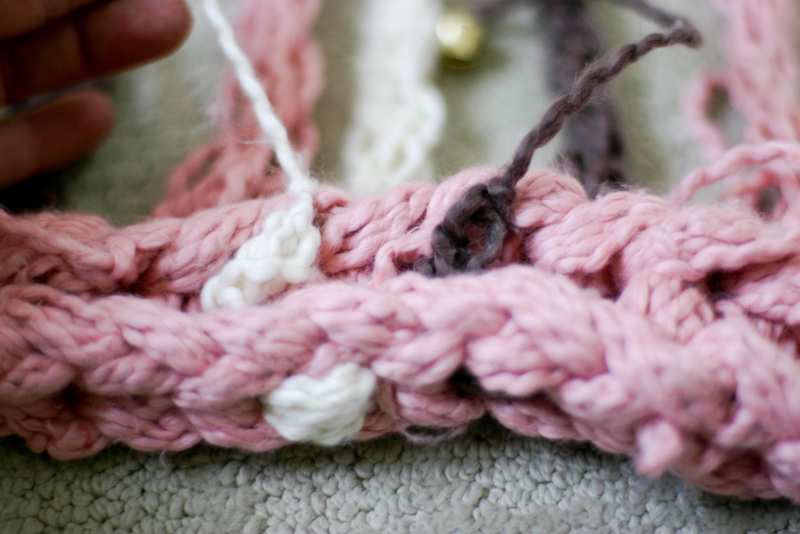 For each of the other four strands of belled finger-knitting, alter the starting spot of the bells (for example on the next strand, add a bell after 16 rows, then add another every 16 thereafter) so the bells don’t line up once hung. For lack of a better word, I’m going to call this top part the valance. 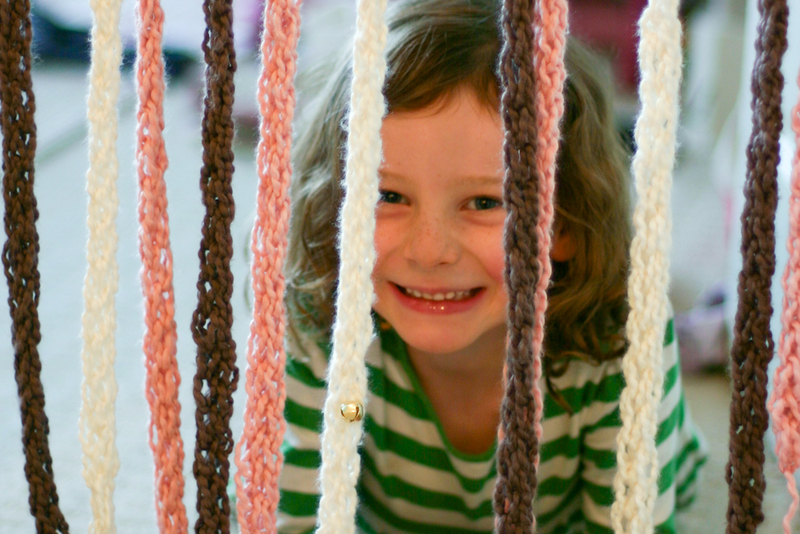 It is the panel that the finger-knitting will fit into and hang from. 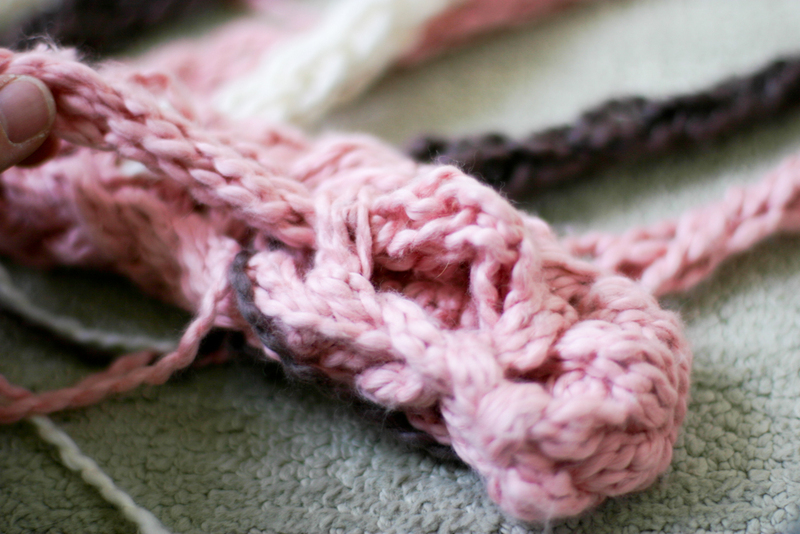 It is made of a finger-knitted strand of finger-knitting. Isn’t that fun?? 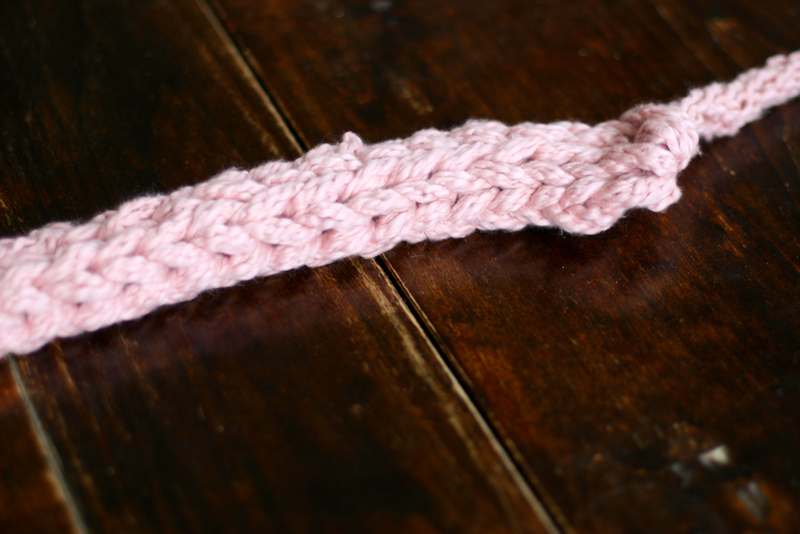 The finger-knitted strand you start with needs to be fairly long (I think at least 12 to 15 times the width of the door). I just added more strands until it fit. This too will stretch some. 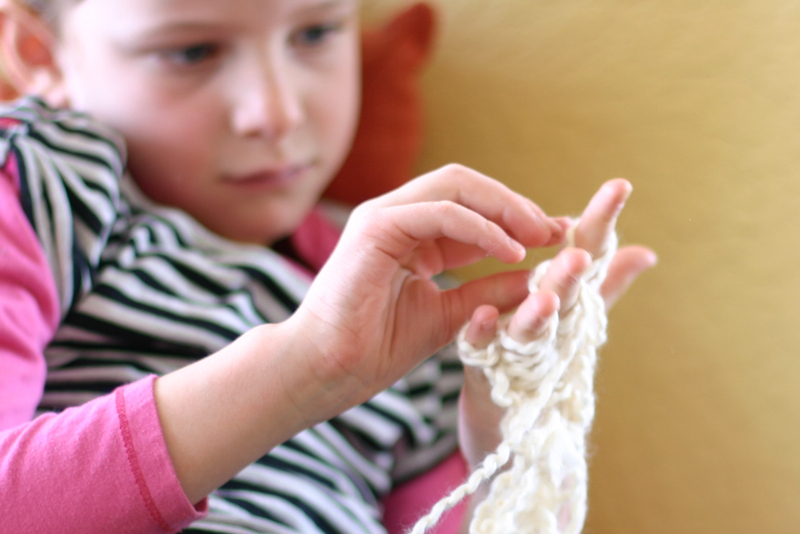 You finger knit the finger-knitting as if it were a piece of yarn. It should look like this at the end. Make sure it is long enough to stretch most of the way across your door frame. 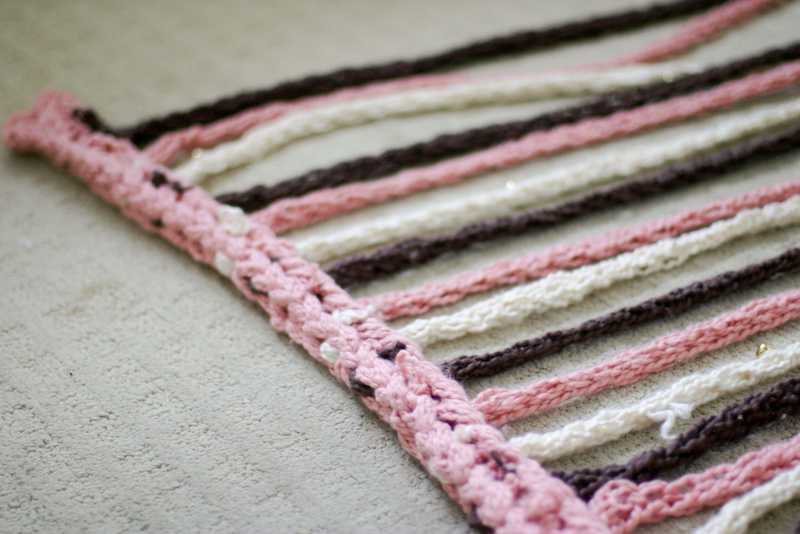 Decide on the pattern of strands. Lay them out. 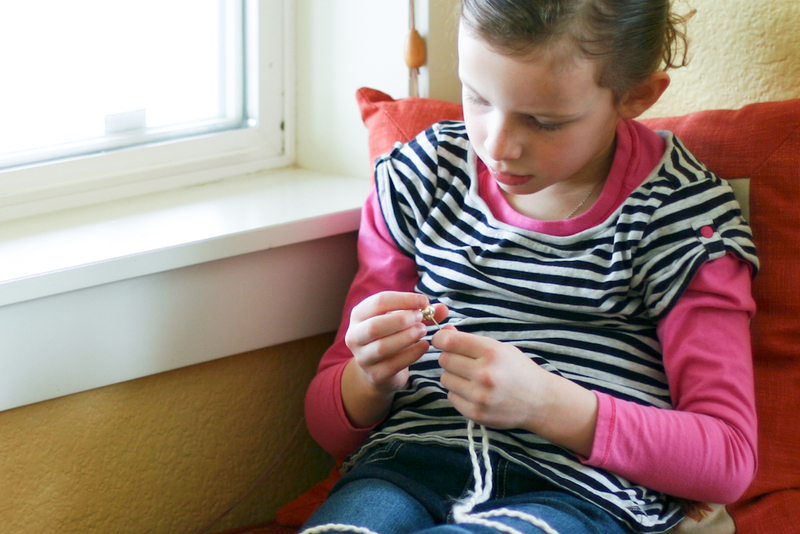 Weave each strand of finger-knitting under and over a row of finger knitting in the valance. Turn the strand at the top, and come back down the next row, weaving in the same manner. Here is the back and top of the valance. 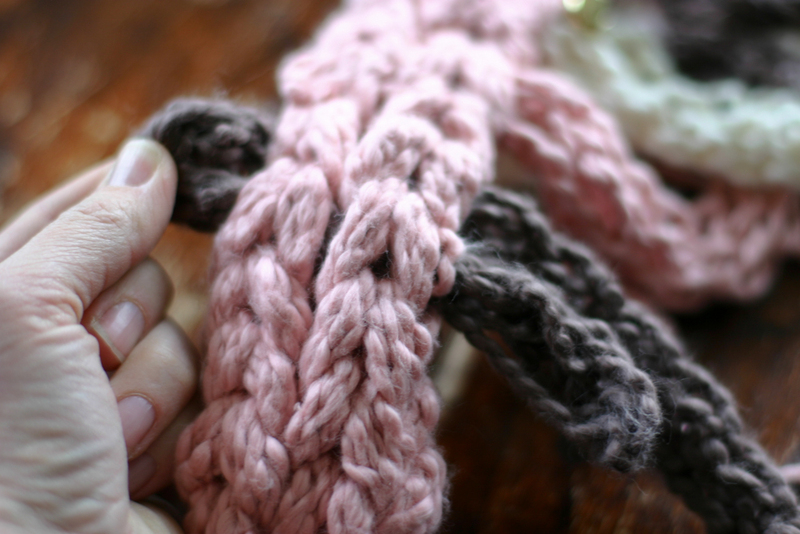 Tie the tails of each strand of finger knitting to the bottom and back of the valance. 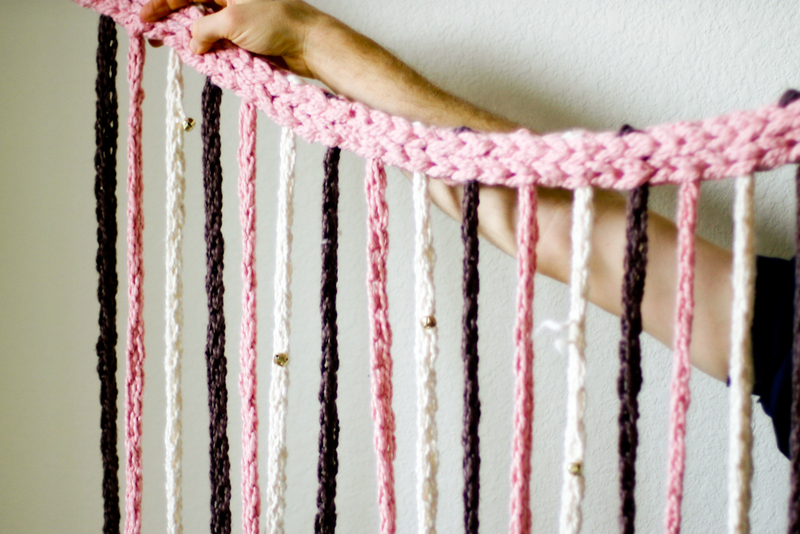 Weave the ends of the valance into the back of itself. We hung it with super sticky backed plastic hooks. It has been up now for over three weeks, no damage or falling. 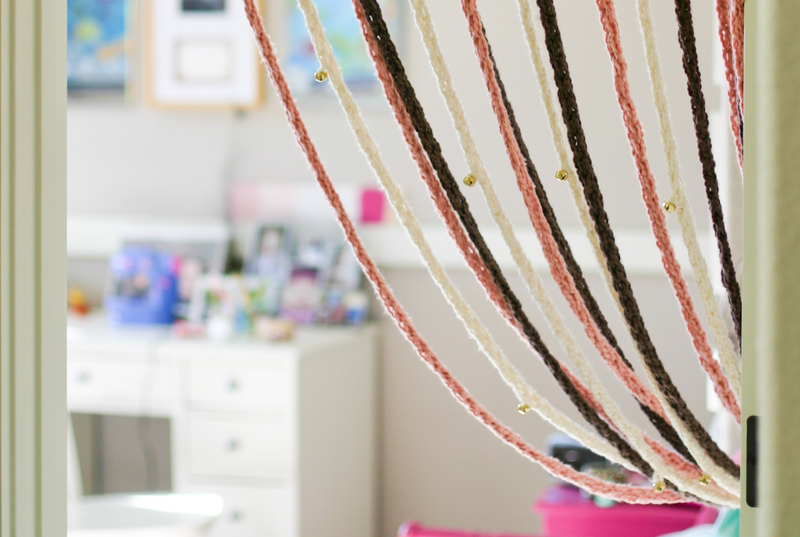 I hope your kiddos love the curtain as much as Allie does. Tomorrow (with the help of my boys) I’ll start one!!! Thank you sooo much for sharing this beautiful project!!! Thanks every one! I’m so glad you like the curtain. Its a ton of fun to make! 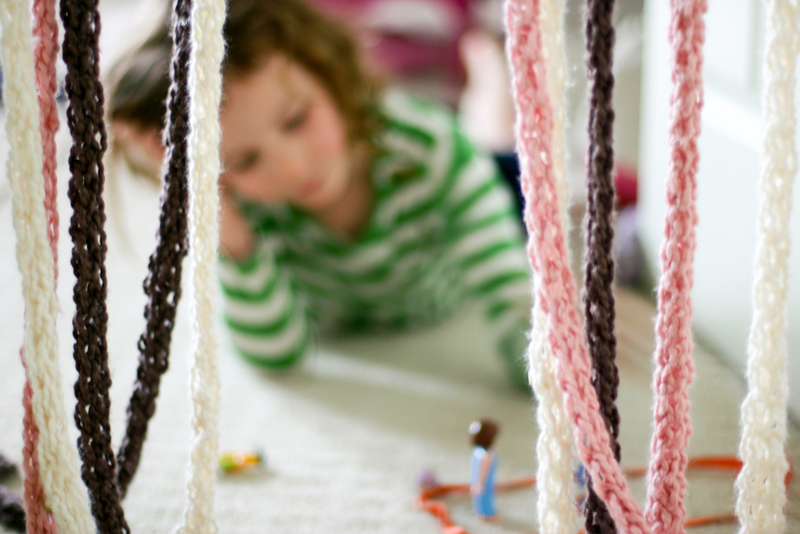 I know what you mean about the groovy beaded door curtains – I feel/felt exactly the same way… This finger knitting looks interesting and could be just the thing for my four-year-old to try, he’s always wanting to knit along with me!! Nice curtain! How adorable! And what a nice thing to work on together and create! Love it. 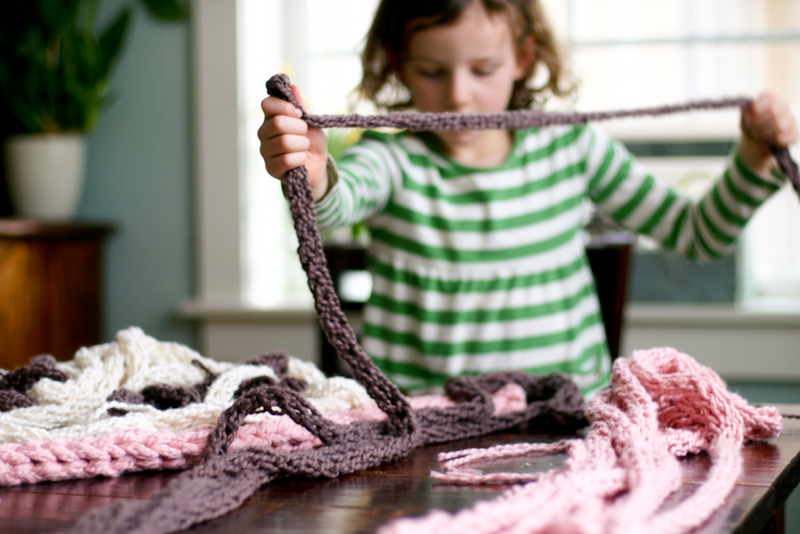 My daughter is too young to finger knit at the moment…but when she is old enough I’m sure we will be doing this! like the curtain…Look beautiful….I appreciate you share it. Hi there! I love this curtain! And the idea of adding the bells periodically inspired me to try adding beads because my kids like to make fingerknit jewelry. I linked to you as my inspiration in my post today – hope that’s ok! I am 11 and I love this blog. 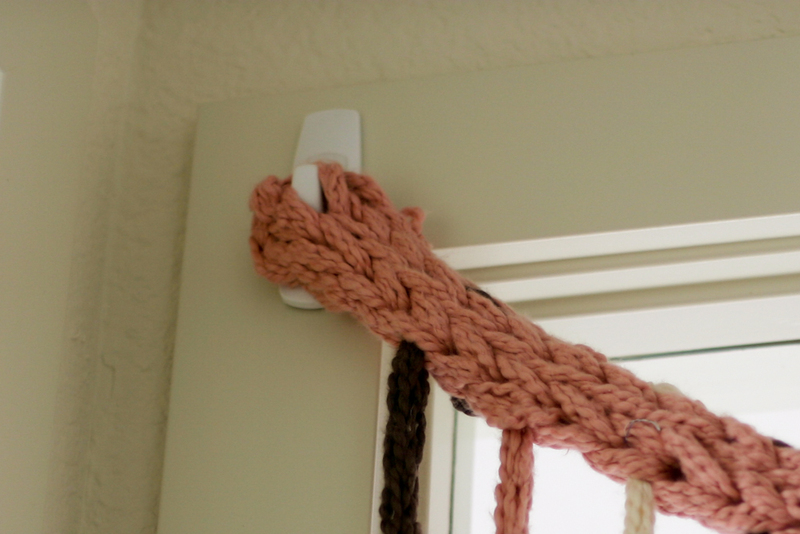 I love crocheting and finger-knitting and I think this is a creative idea. 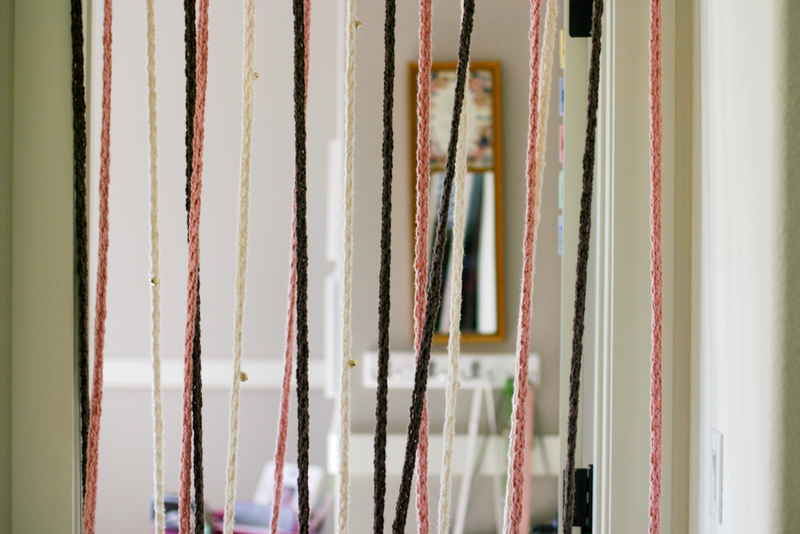 I finger-knitted a jump rope today (with two fingers and it didn’t work well) but I am sure I can make this and it might work as a window curtain. Maybe if we put the drapes more close together. Carolynne, you’re so sweet. Keep making. i know you can do it. I’m glad you like the blog! I’ve just found your blg via a post on Pinterest. I’m loving everything! Thank you so much for this fantastic idea! 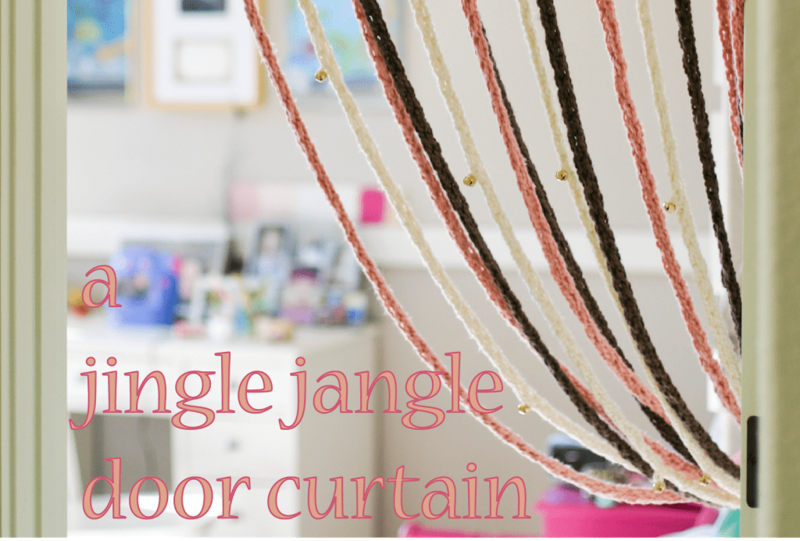 We have a doorway separating our room and closet area and I’ve been thinking about what kind of curtain to make for it….found the perfect solution here. Thanks! Hi! 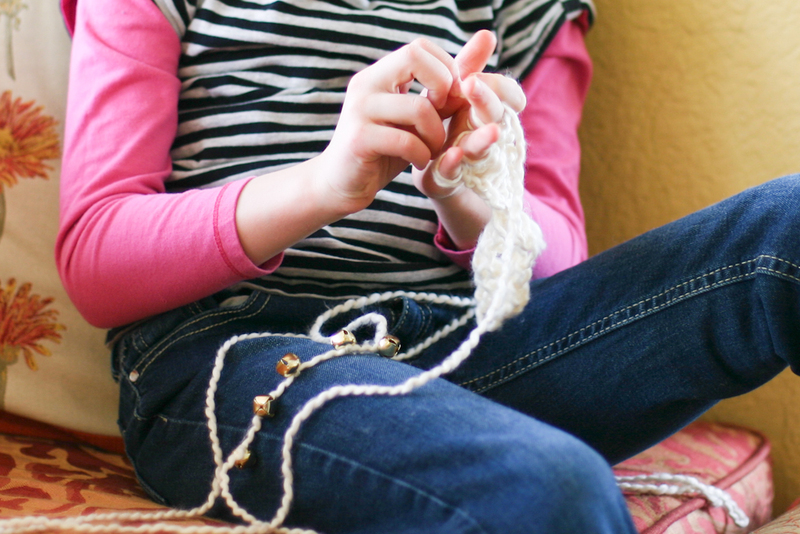 Are you talking about regular finger knitting or finger knitting with something woven in to it? Are you selling these? I do not knit but have been looking for something like this for a while. Hi Samuel, I’m so sorry, I don’t sell this. Thanks so much for inquiring. I really appreciate your interest!